Okay, so I know that I'm just asking for a litany of responses saying, "what are you smoking"", and, "I guess you like crappy wrestling" in writing this article. I feel the need to include a disclaimer; that disclaimer being that my following sentiments have nothing to do with the enjoyment of in-ring competition. What I am about to write is driven purely by nostalgia and remembrance of the end of an era. Perhaps I am a mark for the "good old days", but nevertheless, I'm sure some students of pre-Attitude Era wrestling will agree with some of my sentiments. I have fond memories of the Dungeon of Doom. That's right, I said the Dungeon of Doom. You may scratch your head at this thought. You may wonder, "why would anyone have fond memories of such a cheesy gimmick"". I will be the first to admit that it was indeed one of the cheesiest gimmicks ever. From the "The Giant is a superhuman man who was revived from the dead" angle, to the "Kevin Sullivan went all the way to Scotland and found the Loch Ness Monster" angle, the Dungeon of Doom is one of the cheesiest gimmicks ever devised in professional wrestling. Not that it's any more laughable than the Mountie, or the Repo Man, etc., but it's arguably the most cheesy ever because of the fact that there were so many ridiculous, implausible angles all crammed into one astonishingly lame faction. Not only was the gimmick preposterous, but the wrestlers in this faction were mind-numbingly untalented. You had guys like Kevin Sullivan, The Giant, The Shark (John Tenta), Kamala, and the One Man Gang. The tile of most talented wrestler in the group, sadly, was probably a tie between Meng and the Barbarian, and these were two washed up men whose heydays had long since passed. Konnan would later join this faction, but it was dying at the time. I have two reasons, however, for remembering this faction so fondly. For one, I was very young (7 years old) when I started watching pro wrestling. At this time, the Dungeon of Doom was at the top of the business. Since I was only seven years of age, and I wasn't aware of the fact that wrestling is only "sports entertainment", the whole gimmick felt so real to me. I remember fearing for Hulk Hogan at Uncensored '96 when Kevin Sullivan held him over the side of the Doomsday cage, appearing as if he had the intent of dropping the Hulkster three stories. However implausible the story, I bought it, and I genuinely believed that a faction was hell-bent on destroying Hulk Hogan and all of his allies. Ah, to be young and gullible. Actually, youth provides a perfect segue for my second, more solid reason for having positive memories of this gimmick. Looking back, the Dungeon of Doom was probably the last vestige of the pre-Attitude Era in wrestling. When The Giant put Hulk Hogan in a Bear Hug or a Chokeslam, it wasn't the most particularly enthralling thing in all of wrestling, but it was something the whole family could watch without anyone's eyes needing to be covered. The Dungeon of Doom was a harmless gimmick, and Paul Wight's old character was merely a poor attempt at a duplication of Andre the Giant. To the gullible children out there like myself, that gimmick was the most outrageous thing a wrestling federation could display without having my parents instantly change the channel on our television set. It was what pre-Attitude Era wrestling was all about; having a big bad group of bullies take on a courageous hero or two. The struggle between Hulk Hogan/Randy Savage and the evil dungeon epitomized that. The Dungeon was probably the last gimmick used in such a way. Even though it officially became defunct in 1997 when Chris Benoit defeated Kevin Sullivan in a retirement match at Bash at the Beach, the true demise of the Dungeon came far earlier. The last time it was truly used for its intended purpose was in the Pay-Per-view entitled Uncensored in the year of 1996. The faction originally formed when a group of men united, all with the common goal of ruining Hulkamania. This occurred some time during mid-1995 and the group originally contained names like "The Taskmaster" Kevin Sullivan, The Zodiac (Brutus Beefcake dressed sort of like a zebra), The Shark (John Tenta, aka Earthquake), Kamala, Vader, and Big Bubba Rogers (Big Bossman). Eventually, Paul Wight came to World Championship Wrestling and Eric Bischoff couldn't pass on the golden opportunity to rekindle the old Hogan-Andre rivalry, so it was purported that The Giant (Paul Wight, aka the Big Show) was the son of Andre the Giant, and he repeatedly stated that it was his "birthright" to win the WCW heavyweight title. With Hogan being the champion, and Kevin Sullivan's faction losing at Fall Brawl to the Hulkamaniacs, The Giant of course almost instantly became a member of the Dungeon. He won the title at Halloween Havoc of 1995 and the title changed hands repeatedly over the course of the next couple months. Over that time frame, the Dungeon accrued new members while losing old ones. 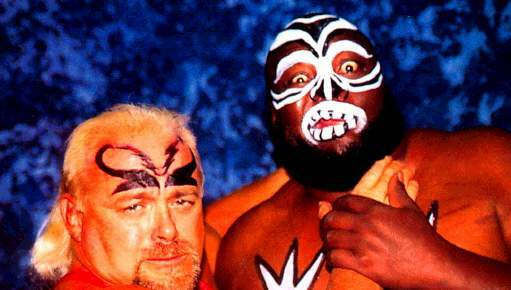 Kamala left the WCW, The Shark went from friend to foe along with Brutus Beefcake, who took on a new gimmick of "The Booty Man" and became a "Hulkamaniac". Vader also left the WCW for the World Wrestling Federation. In turn, the Dungeon acquired new faces, such as the Barbarian and the One Man Gang. One of the most obscure of them all, yet one of the most integral in the mix, was the Loch Ness Monster. Most people don't remember him, and quickly overlook him in naming Yokozuna the heaviest wrestler of all time in mainstream American professional wrestling. Remarkably, the Loch Ness Monster hovered around 700 pounds, while Yokozuna topped at somewhere around 650 near the end of his career. I still remember Superbrawl of 1996, the night when the Loch Ness Monster was first introduced. Hogan had defeated The Giant in a cage match, and the Dungeon of Doom all flooded the ring as a result. Hogan disposed of the Dungeon members one-by-one, until Loch Ness finally made his way toward the ring. Instead of "unleashing" the beast on Hogan, Dungeon members held him back, hoping to sick the giant man on Hogan on a more opportune occasion. That occasion would never occur. Before the Dungeon could ever use their newest acquisition on Hogan, he learned that he had cancer and left the WCW. Actually, he first left the Dungeon and feuded with The Giant, ultimately meeting him at Uncensored of 1996. Still, there's a good chance that Hogan and the "Loch Ness Monster" would've met at some point. Instead, the New World Order became the next big thing in the WCW and the organization's own "Attitude Era" of sorts unofficially began. The Dungeon needed a new feud, since Hulkamania truly ended, at least temporarily, at Bash at the Beach 1996 when Hulk Hogan denounced it himself and joined the nWo. Writers turned to the Four Horsemen, who were at one point aligned with the Dungeon with the hopes of eliminating Hulkamania. It started with a Chris Benoit/Kevin Sullivan feud and escalated into a heated rivalry between the two factions. The problem was, neither faction was even close to being at the center of the WCW any longer. The New World Order was king, and the Dungeon and Horsemen became sloppy seconds to the larger focus within the organization. In spite of their notoriety and popularity, the Horsemen were repeatedly shelved by the organization and deemed an old, worn-out gimmick that was unable to generate interest any longer. In spite of the fact that buildings would be filled with fans putting up the infamous four-finger sign of the Horsemen at WCW events, the Horsemen were put on the shelf, and so was the Dungeon of Doom as a result. They were both shelved in favor of a more outrageous gimmick, one that represented the rudimentary form of the "Attitude Era" across wrestling. While this is fine and dandy, and I really do enjoy the Attitude Era in either organization, it was sad to see the demise of the previous era in wrestling. An era in which the wrestlers wrestled and the right men did the talking at the right times. It was unlike its successor, the new Attitude Era that had anyone capable of speaking at the mic, which often included some of the most painstakingly horrible microphone users. Before then, the ever-inspiring Jimmy Hart would be left to do a lion's share of the mic-work, and boy was he ever good at the mic. Guys with true command of the crowd would grab the microphone and address the audience, or heat up a current feud. After that, people who we just didn't care about would start blathering on, putting off the actual wrestling that we craved. Actual wrestling was harder to come by during the Attitude years. Before then, people would get in the ring, and entertain the fans the way they wanted to be entertained. Sure, the quality of the wrestling may not have been as good sometimes, but I'll take a Diesel/King Mabel match over a microphone session with some insipid jobber any day. Saying goodbye to this incredibly cheesy, lame, implausible, ridiculous "Dungeon of Doom" gimmick, oddly enough, would signify a goodbye to a very lovable era in wrestling that contained some of our favorite stars. An era in which we were truly engaged, an era in which wrestling was meant for the masses and not just young adult males, and an era in which wrestling was pure. Wrestling during those days, quite simply... was wrestling.